NFL officials ended their labour dispute with the league by approving a new eight-year contract with a 112-5 vote Saturday, then hustled off to the airport to get to work. Next stop, stadiums around the country. And, the officials hope, anonymity. "The last Super Bowl that I worked, when we got in the locker room, I said, 'You know, the best thing about this game, nobody will remember who refereed this game,"' said Scott Green, president of the referees' association. "That's how we like to work." The vote ended a labour spat that created three weeks of increasingly chaotic games run by replacement officials who drew criticism of everyone from the average fan to President Barack Obama. "It was pretty much 'Come on in and vote,"' Green said. "We're going to talk football now. We're going to stop talking about CBAs and lockouts and now we're going to talk about rules and video and getting ourselves ready to work football games." They may get ovations similar to the one bestowed on the crew that worked Thursday's Cleveland-Baltimore game with the tentative deal in place. The referees met for about an hour and a half Friday night to go over the contract, then gathered for another 30 minutes Saturday morning before approving the contract. "We are obviously pleased to hear it," NFL spokesman Greg Aiello said in an email to The Associated Press on Saturday. Because they were aware of the financial parameters, most of the discussion by the referees involved non-economic issues such as year-round work and developmental squads, said Tim Millis, the association's executive director. The deal came together quickly this week after an increasing chorus of complaints became impossible to ignore when a disputed touchdown call on the final play gave the Seattle Seahawks a victory over the Green Bay Packers on national television Monday night. Many thought the ruling of a Seattle touchdown instead of a Green Bay interception was botched, and the labour dispute drew public comments from Obama and his Republican challenger Mitt Romney. By late Wednesday, the sides had a contract calling for refs' salaries to increase from an average of $149,000 a year in 2011 to $173,000 in 2013, rising to $205,000 by 2019. The current defined benefit pension plan will remain in place for current officials through the 2016 season or until the official earns 20 years' service. The defined benefit plan will then be frozen. Retirement benefits will be provided for new hires, and for all officials beginning in 2017, through a defined contribution. 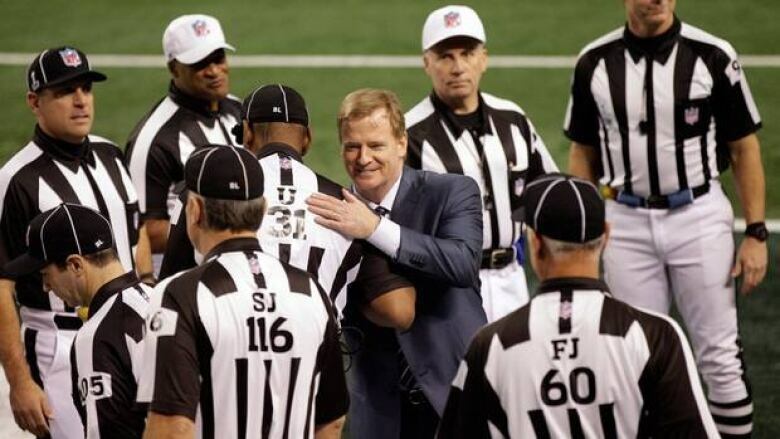 Beginning with the 2013 season, the NFL will have the option to hire a number of officials to work year-round. The NFL also can retain additional officials for training and development and assign those officials to work games. The number of additional officials will be determined by the league. The officials that worked Thursday's Ravens-Browns game were cheered from the moment they walked onto the field. The difference between the regular crew and replacements was clear. The officials kept the game in control, curtailing the chippy play and choppy pace that had marred the first three weeks of the regular season. "I think the thing we're most proud of is the lesson that we all learned," Green said. "If you're going to be in a professional league, you've got top-notch coaches, you need professional officials as well."